"Managing multiple daily medications is challenging especially when those medications might be prescribed for a member by multiple physicians. Remembering all the names and when and how to take them can be a daunting task"
LOUISVILLE, Ky.--(BUSINESS WIRE)--A new tool developed by Humana Inc. (NYSE: HUM) enables Humana members to more easily keep a list of their medications in one place, helping members stay organized to improve medication management, safety and clinical outcomes. 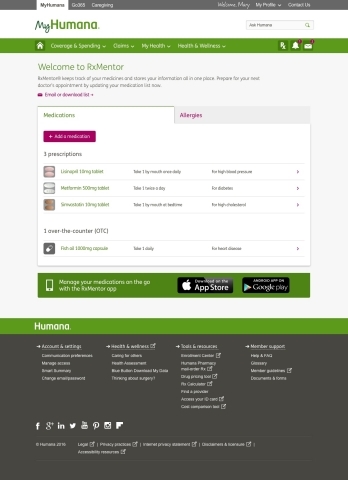 Members can access the RxMentor tool via the MyHumana.com website or by downloading the app for iPhone and Android devices. Keep an up-to-date list of their prescription medications, vitamins and supplements, other over-the-counter items and personal allergy information in one convenient and easy-to-access place. Automatically receive medication history into the tool. Medications are based on claims data for the past 180 days; members will receive a prompt to update their medication list when there is new claims data. Easily print or share their medication list via a secure email with caregivers, family, doctors and other health care providers. Make notes in the app about a medication, such as how to take it, when to take it and any reactions. This is especially convenient when members are in the doctor’s office and need to write down instructions for a newly prescribed medication or share side effects for an existing medication. For members with multiple conditions who might be on several medications and qualify for a comprehensive medication review, the tool will prompt them to schedule a complimentary one-on-one consultation with a Humana pharmacist to conduct a medication review. In addition to the user benefits, the RxMentor tool will allow physicians and health care providers to feel more confident in their medication prescribing management when the list is shared with them. This is because the app pulls from claims data in addition to medication and allergy information that is self-reported by the member. Humana has a Bold Goal to help its members be 20 percent healthier by 2020. Part of being healthy is taking medication safely and as prescribed. According to the American Heart Association, nearly three out of four Americans do not take their medication as directed resulting in nearly $300 billion a year in additional doctor visits, emergency department visits and hospitalizations. Members can get started by logging into Humana.com and selecting the RxMentor tool or downloading the app from the App Store for iPhone and the Google Play Store for Android. Humana Pharmacy Solutions, a division of Humana Inc., manages traditional pharmacy benefits with member-focused strategies to yield savings in pharmacy and total health expense. Providing prescription coverage for both individuals and employer groups, Humana Pharmacy Solutions strives to give members access to the medicine they need while offering guidance on clinically proven, therapeutically equivalent drugs that bring better value to the member and the customer. For more information visit www.Humana.com/Pharmacy.